Mbappe spent his formative years developing his skills at AS Bondy in the north-eastern suburbs of Paris. The club are experiencing a surge in popularity and are inundated with new members wanting to follow in the footsteps of Mbappe. 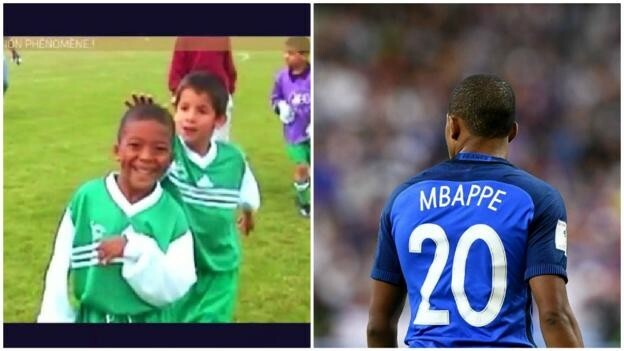 BBC Sport went to the club where Mbappe started his football journey when he was just a toddler and spoke to those who knew him. For more from BBC World Service, download their World Football Podcast. AS Bondy's senior team play in the 10th tier of French football, in the "Excellence" division of the League of Paris ile-de-France but they have a very successful youth system. Players who have passed through their age groups include Sevilla's Sebastien Corchia and DR Congo international Fabrice N'Sakala. Up until only three months ago, Mbappe's father Wilfried was one of the sporting directors at the club looking after the age groups from under-10s up to under-17s but he has had various roles over 25 years at AS Bondy. Atmane Airouche, president of AS Bondy: "You could say that Kylian was born here at this club. He was here as a baby when his father was a player and a coach. He was always here and learning about football, even as a toddler. "When we played games, just before kick-off you'd see a two-year-old walk in with a ball and he'd sit with us to listen to the team talks. I think he's the player here who must have heard the record number of pre-match team talks." Antonio Riccardi, 28, under-13s coach at AS Bondy: "His father is like my second father so I knew Kylian as a baby but the first time I coached him was when he was six years old. Just a few months after he had started playing here for the debutants age group you could tell he was different. "Kylian could do much more than the other children. His dribbling was already fantastic and he was much faster than the others." Airouche: "He was born into football and sport. His father was a youth leader, working with children in the local area and then he was brought in to AS Bondy. He only left us three months ago but his imprint will be here forever. He gave 25 years of his life to us. And his mother is also a big influence. She was a very good professional handball player." Mbappe was at the famous Clairefontaine academy between the age of 12 and 15 but initially continued to play for Bondy. Riccardi: "Kylian would always think about football, always talk about football, always watch football - and if he wasn't doing that he'd be playing football games on the PlayStation. "He'd even turn his living room into a football pitch. When he was young I used to take Kylian home from training and I'd babysit until his mother got home from work. "He always wanted to play in the living room! The sofa or the table would be the goal. He'd say: 'Don't tell my mother, don't tell my father because they don't want me to play here. Please don't tell.' So we used to play and I kept that secret for him. Luckily he never broke anything." Airouche: "He only thinks about football and that's what makes the difference compared to others. "Other players think that once they've signed for a club or gone to Clairefontaine they've achieved something, that they've arrived. But no, the hard work is only just starting and Kylian knew that. He'd play anywhere. "If he came here now and fancied a game he'd just play even now he's a pro. All he thinks about is the game." Riccardi: "He was a big fan of Cristiano Ronaldo. They were the posters on his bedroom wall, but he was a fan of lots of great players. He didn't follow a particular team but he was a fan of many top footballers. Ronaldo was definitely his childhood hero though." Mbappe agreed to sign for Monaco at the age of 14. He is said to have turned down every other Ligue 1 side, plus Real Madrid, Chelsea, Manchester City, Liverpool and Bayern Munich. He made his first-team debut for Monaco on 2 December 2015 as a late substitute - in the process breaking former France striker Thierry Henry's record to become Monaco's youngest player at 16 years, 347 days. Mbappe was one of the stars of the Under-19 Euros in Germany in 2016, scoring five goals, including two in the semi-final. The top scorer at that tournament was Jean-Kevin Augustin, who has just left PSG to join German side RB Leipzig. Riccardi: "Kylian was always enthusiastic. You have to work hard when you have a talent like he does because if you don't, others that are less talented but are working hard can catch up. "In Bondy there were no real moments of difficulty for him because he was far better than the others. But I know that in Monaco the first year was difficult for him because he had a coach that didn't like him very much. Today that coach is no longer at Monaco and Kylian is in PSG and the national team. So it was the coach who was in the wrong." Airouche: "We went to watch him at the under-19 final, which France won. We met him outside the stadium and we were shocked that he didn't want to go partying with his team-mates. Instead he wanted to go straight home. "To him, he had achieved his goal to be European champion and was already thinking about his next goal: going back to Monaco, getting into their team, winning more titles. "I remember when Monaco became champions he was the only player on the pitch who didn't have a mobile phone with him during the celebrations. All the others went out partying, he was the only one who went home to sleep. That's what is so great about him. "Other professionals should learn from Kylian. You've never reached your goal. Work harder and harder every day." Mbappe often posts on social media about his family and is very close to his father, Wilfried, and mother, Fayza. He passed his high school exams in science and technology management, combining his studies with his football development. Airouche: "He's a little boy from Bondy who loves football and respects people. That's what we give to our children here. He loves his town, he loves this club, he still talks about it to this day. He's always behind us and when he gets the chance to see the little ones here he does it. That's why lots of people like him because he is simply himself. "He is a young man who seems to have the maturity of a 40-year-old when he speaks. That's his personality. Generous, respectful and when he comes here he's always just a boy from Bondy and a boy from ASB." Riccardi: "He's the same now as he was back then. If he came here now he would say hello to all the young players here, he would give all the coaches a hug, he would take a ball and play with the others. "We still call and text each other and it's the same easy-going conversations that we had when I was his babysitter. He will never change because his education is so good. Behind him he has his parents, who are fantastic people. He has a great family unit. He believes in family and he doesn't want to let them down." Airouche: "Kylian's personality - when you see him speaking at 18 but sounding like he's 30, talking with phenomenal maturity - is because of what his parents gave him. They're people that always had their hands on their hearts, they helped a lot. Not just their children but the children here at the club, for them it was the same." Riccardi: "A move he used to do as a kid that he still does now in the 'passement de jambes' (the stopover). It was his trademark as a boy. From seven or eight years old he was doing that. "He was the best player I've ever seen in 15 years coaching here. Nobody has even come close. In Paris, there are many talents but I'd never seen a talent like him. He was what we call a 'craque' (the best)." Airouche: "When he was little he was always the smallest but he had technique and vision in the game that most children just don't have. That's why when you see him now you notice he has amazing senses. He's got eyes in the back of his head. He knows how to anticipate where the ball will go. "Here, he never played for his proper age group, he always played with older children because there was no point leaving him with kids his own age. He'd just get bored. "Physically that was tough because he was small, but he had the talent that made the difference. He was a phenomenon. Then suddenly, he grew up. I remember not seeing him for a while and then when we met up again he was suddenly as tall as me." A version of this article was first published on 26 September 2017.